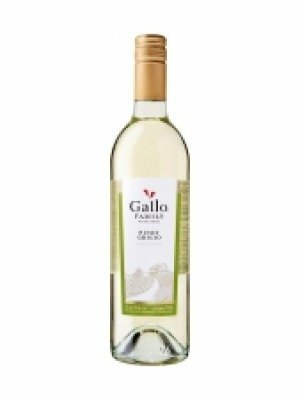 Gallo Family Vineyards Pinot Grigio is a popular American White Wine available from Tesco Groceries in 75cl to buy online. Visit Tesco Groceries for the best price for 75cl of Gallo Family Vineyards Pinot Grigio or compare prices on our other American White Wine products. Light and fruity, displaying apple and lime touches. Great in the mouth with innuendos of herbs and floral undertones. Pairing well with grilled chicken, seafood and mildly spiced pasta dishes. Pairs well with seasonal treats such as fresh fruit salad or grilled sea bass or drink as a balance to mildly spiced Asian recipes. Where to buy Gallo Family Vineyards Pinot Grigio ? Gallo Family Vineyards Pinot Grigio Supermarkets & Stockists. You can buy Gallo Family Vineyards Pinot Grigio online in most retailers and find it in the American White Wine aisle in supermarkets but we found the best deals online for Gallo Family Vineyards Pinot Grigio in Tesco Groceries, Tesco Wine, and others. Compare the current price of Gallo Family Vineyards Pinot Grigio in 75cl size in the table of offers below. Simply click on the button to order Gallo Family Vineyards Pinot Grigio online now.